There are 9 blog entries for March 2013. Wednesday, March 27th, 2013 at 3:11pm. We have great news we have to share! The Happiest Job in America in 2013 is Real Estate. Forbes just listed the top 10 happiest (and respectively happiest) jobs in America. The #1 happiest job was a real estate agent. Careerbliss surveyed 65,000 people to come to this blissful conclusion. The logic behind this is real estate agents are rewarded for their success. They can have a flexible schedule and increase their income with hard work. The careers with less rewards and more office politics scored the lowest on the happy rating including associate attorney, customer service associate and sadly RN’s and teachers. Thursday, March 21st, 2013 at 2:36pm. The full floor units at Zaha Hadid include 11,000 square feet each. There are two designs to choose from, each with 5 bedrooms, 9 bathrooms, living room, dining room, family room, kitchen, media room, laundry/staff room, gallery and office. Each unit also comes with a terrace with a depth of fifteen feet with spectacular views of Miami. These exclusive Miami condos are placed on the 51st-58th floor for top placement. Tuesday, March 19th, 2013 at 12:36pm. 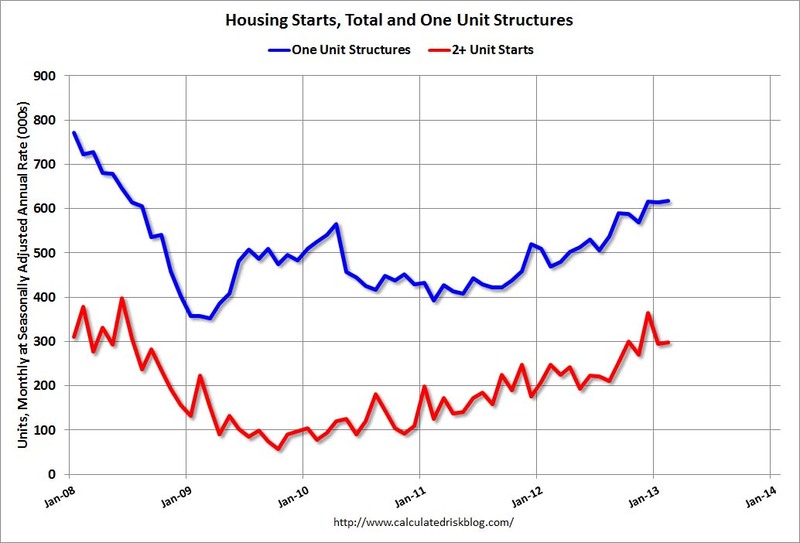 The Feburary 2013 report from the US Census revealed some interesting news for multi family units. New Privately-Owned Housing Units Authorized in Permit-Issuing Places increased 54.9% from Feburary 2012 to Feburary 2013. In February 2013, 285,000 buildings with five or more units began construction for units in buildings with five units or more, up from 240,000 in February 2012. As the economy recovers, we expect more completed projects as many we on hold or canceled from 2008-2012. View some recent developments in Highrises.com's New Buildings Blog. Sunday, March 17th, 2013 at 1:30pm. The Las Vegas Valley median price of single-family homes sold in the region in February was $150,000, unchanged from January but up 24 percent from $121,000 in February 2012, according to a report out today from the Greater Las Vegas Association of Realtors. A total of 3,232 previously owned homes were sold in the valley last month. That's up from 2,821 in January but below February 2012's total of 3,794. Short sales, in which lenders agree to sell a home for less than what's owed on the mortgage, accounted for 38 percent of all deals last month. Sales of bank-owned homes comprised 10 percent of February's total. Thursday, March 7th, 2013 at 6:42am. Do you ever wonder why a short sale listing will continue to show as "for sale" on the website even though it's under contract? A message went out to Equator agents from Bank of America with a direction that all short sale listings should remain “Active” until the short sale approval letter was issued. This letter is not usually issued until right before closing, long after a contract is executed by the buyer and the seller. Wednesday, March 6th, 2013 at 5:04pm. After the Colorado Company, Condo Capital Solutions (CCS) bought 93 units at the Summerlin Mira Villa Condos 2011, they have sold 19.3 million in condos. The Mira Villa have sold in the range of $365,000 to $1.3 million, with the average around $500,000. These luxury Summerlin condominiums just had a second release of more units for sale on March 1st, 2013. Mira Villa is a new luxury mid-rise community in Summerlin. Step outside and find yourself in an oasis of tranquil pools, spas, and quiet nooks, connected by lushly landscaped walking paths. Other amenities at Mira Villa include resort-style pool with waterfall, state-of-the-art fitness center, clubhouse, private elevators to all residences and a poolside fire pit. Tuesday, March 5th, 2013 at 12:37pm. Friday, March 1st, 2013 at 6:46am. Everybody knows that the best way to get your product or service noticed on the internet is to put it where there's the most traffic. Especially when the traffic is targeted to your specific product. If you have a condo or loft in the Nashville area Highrises.com/Nashville is the place you want your property to be. We are consistently ranked in the top search results on Google and other popular search engines. Nashville Condo and Loft Buyers are looking HERE for your listing! As we move into the spring selling season, Nashville is poised to turn toward a Seller's market - something we haven't seen in quite a long time.